A Bimini top is a cover for the cockpit of a small boat. 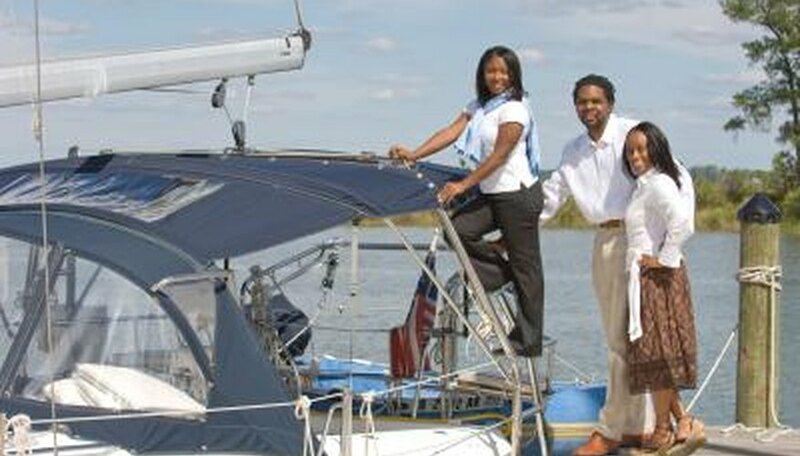 Bimini tops are usually supported by a metal frame, have an open front and are made from a heavy duty canvas. Since their front is open, they are mostly used as a sun and rain shelter, unlike dodgers, which offer protection from all four sides. If you are a sailing enthusiast or you simply want to add a custom and homemade element to your boat, you may want to know how to make a Bimini top. Decide on the shape and dimensions of your Bimini top. Draw a detailed plan for the metal frame and then for the actual shade made from fabric as well. Then purchase the necessary materials according to your plan and your needs. It is best to buy stainless steel for saltwater and aluminum for freshwater when it comes to the metal frame. Choose approximately a ¾-inch perimeter pipe or tubing for the frame. Check out websites and magazines that deal with boats, marine hobbies and custom made equipment for boats to get some inspiration for the final shape and overall design of your Bimini top. Measure the tubing and indicate the exact places for cutting with a permanent marker. Use a power saw to cut the pieces of tubing for the metal skeleton of your Bimini top. Bend the elements of the metal frame for your Bimini top if necessary. Some Bimini top designs have all straight parts and require no curved elements at all. If you, however, need to bend a metal pipe, use a conduit pipe bender that can be purchased in every hardware store. Finish the metal tubing for the frame by drilling the holes necessary for attaching the fabric on the top pipes. First mark the places for the holes and then use a power drill to make the holes. Assemble the metal frame for your Bimini top by attaching all the tubing in the correct order, following your plan. For joints, use fittings that you previously bought according to your preferences. There are stainless steel, nylon and brass fittings available on the market and each has a different quality to price ratio. If you have stainless steel tubing in the frame, it is best to use fittings made from the same material. Aluminum tubing can do just as well with nylon fittings. Steel fittings are strong, durable but expensive; nylon fittings are relatively strong yet inexpensive. Brass fittings are inexpensive too, but they often corrode and peel off. Tighten the screws that hole the fittings in place with a screwdriver and make sure that all the joints are firm and strong. Try to shake the frame vigorously to see if the fittings move or are loosened. Measure the metal frame of your Bimini top to see if it matches the plan. Purchase the fabric you want to use as the actual shade of the Bimini. Choose between cotton canvas, marine vinyl, polyester and acrylic. Every one of the four basic options has its advantages and flaws, but note that none can last forever. Obviously, cotton is the only fabric that isn’t waterproof, so you might concentrate on the other three. They all hold against the sun relatively well, but vinyl tends to become brittle after a while. Acrylic, on the other hand, sags over time. If you can, buy polyester to cover your Bimini top frame, since that way you will have a waterproof, sun resistant and durable shade. Cut the fabric you bought for the Bimini top and make the necessary preparations to fit it on the frame. Use strong and sharp scissors or a utility knife, depending which kind of a fabric you chose. Before cutting, make sure to leave 2 inches on each side for the sleeve. Use the final metal frame measurements to see how wide and how long the fabric needs to be. Make a 1 ¼ inch hemming for the long sleeve on the edge of every side of the fabric. Slide the sleeves of the fabric on the frame tubing to finalize your Bimini top. If necessary, secure the fabric in its place with screws and finishing bolts or tighten it with ropes and lines. Now your Bimini top is finished and all that is left to do is attach it to your boat with some mounting brackets and then enjoy the ride. There are ready-made metal frames for Bimini tops on the market if you want to make the process easier, but these options are less personal and custom. Be extremely careful when cutting metal and make sure to follow necessary safety precautions and wear personal protective gear.